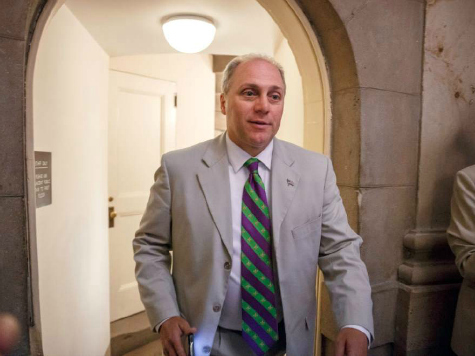 Rep. Steve Scalise (R-LA) has just been elected House Majority Whip by his Republican colleagues. Scalise defeated Rep. Peter Roskam (R-IL) and Rep. Marlin Stutzman (R-IN) in a three-way race that was decided by one ballot. In the days prior to the vote, Scalise took great pains to project strength and inevitability. His supporters huddled Thursday before the vote in the John Dingell room at the Rayburn House office building before marching over to the House Longworth building where the vote was taking place. Scalise led the way with Rep. Sam Johnson R-TX at his side and over 30 other members behind him. “It looks like a Louisiana parade,” one member joked as they approached the building. Stutzman arrived afterwards, holding the hand of his wife Christie, followed by about a dozen supporters. Roskam arrived last. Last night Scalise gathered at a K Street restaurant with 40 of his whips and let reporters know that he was going to batting practice ahead of the vote. As reporters swarmed outside, several staffers with “Geaux Scalise” clipboards tallied the members as they went in. Yet Scalise’s inevitability was questioned by some, especially as some conservatives backed Stutzman. As head of the Republican Study Committee, Scalise took the relatively wonkish group and made it more combative – often creating dissent among Republican conservatives in what used to be collegial meetings. Scalise also crossed the Heritage Foundation, barring its staff from RSC meetings after a nasty fight over the Farm Bill last August. Scalise also ousted popular RSC aide Paul Teller, a staffer who had the respect of many Washington grassroots groups. While his candidacy was seen by many as focusing on his willingness to wrangle conservatives in spite of their hostilities, Scalise’s victory could endear himself to the current leadership.